Bringing transparency to the construction lifecycle - Sumac Geomatics Inc.
Sumac Geomatics already has a reputation for providing high resolution remote sensing, survey and inventory solutions to assist companies who need answers to critical business decisions in mining, engineering and natural resources. We are now proud to announce that we are official Service Partner for the visual construction documentation solution, Photodocufy, delivering photographic documentation to the architecture engineering and construction (AEC) industry in Ontario and Manitoba. Photodocufy brings transparency and reduces risk to the construction lifecycle through collecting a complete image set, that is indexed, securely stored and delivered to stakeholders, at every phase of the project. What is Photodocufy and why is it needed? Photodocufy is an online construction photo management application and photographic construction documentation service. Panoramic images are captured across a site, ensuring complete coverage, at defined phases throughout the construction lifecycle. This provides a complete, singular repository of current progress and site conditions. The construction industry already has high requirements for documentation. Costs associated with rework that result from deviation from the plan, contractual requirements or local bylaws are significant. Especially on institutional builds where there are multiple contractor/sub-contractor relationships, there is increased responsibility for each phase of an engineering or construction project to be well documented. Photographic documentation practices are not new. An image provides a visual snapshot of current conditions that can be understood by most professionals. Nevertheless, not only is there an overhead associated with capturing and storing these images, the cost associated with needing to go back in the future to refer to an image set, especially if it is unorganized, can be excessive. During what is referred to as the ‘blind spot’ period between project completion and full handover of a facility to it’s management agency, in a National Institute of Standards and Technology study by the US government estimated that the cost of locating accurate information for what has been installed in a new facility can cost US$0.23/sq. ft. annually. Don’t contractors just take photographs on their smartphones? We live in an age when everyone has a camera in their pocket. As they walk through site, it is common for site personnel to see an issue and then take a photograph of it. How are those photographs stored, are they indexed, and how can they be shared and referred to in the future? Also, how can you refer to the as-built condition of an installation, when an issue may only arise after project completion? To be sure that nothing is missed, a complete image set needs to be captured across the entire site. This includes images of the exterior of the build that extend down into the foundations, images that show progress of the pour stage, and images across all the ceilings and walls at the rough-in stage, in addition to the finished build. To capture a complete, overlapping image set at just these four phases of a project can obviously lead to many thousands of images that need to be sorted and stored. Over four years ago, the Photodocufy service was designed and implemented on projects in British Columbia. 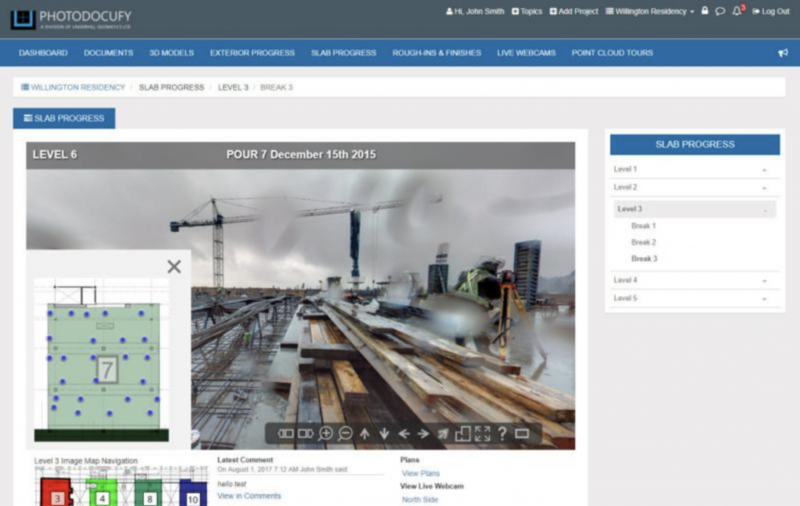 Designed by surveyors; Photodocufy is an end-to-end service that ensures complete image coverage across a site, using consistent camera positions between construction phases that are anchored to a floor plan of the site, and delivered via a secure online viewer to any of the project’s stakeholders that require access. 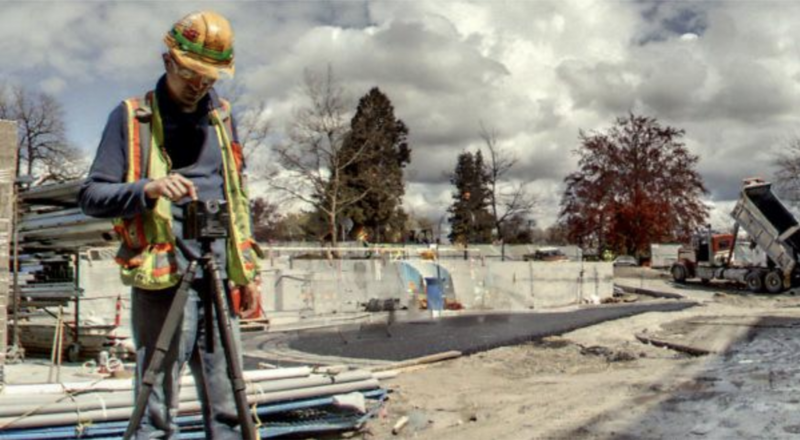 Photodocufy was one of the first services to the construction industry that uses professional grade 360-degree imaging systems to collect full panoramic photographs of site. When viewed via the online viewer, the user can view detail on walls, floors, ceilings simultaneously. One panoramic photograph can take the place of up to eight conventional photographs, meaning that there are significantly fewer images to store and manage. Since a 360-degree camera captures an image in all directions, it is very easy for the user to understand what will be included an image from each camera location on a floor plan. After project closure, for a facility’s manager finding an image that shows a specific element on the build much more straightforward and efficient. Finally, through investing in professional grade 360-degree imaging systems means that Photodocufy uses cameras with very wide high dynamic range (HDR) characteristics. This is where multiple exposures are captured and averaged on a single image; meaning that clarity of inspection grade images can be maintained across the extreme range of lighting and shadow conditions that are present on a typical site. This helps ensure quality across the entire image set, reduces costly image retakes, and means the photographer ultimately needs to spend less time on site. Looking to service the needs of the construction market in eastern Canada, through our reputation for consistently collecting imagery on monthly reporting contracts, the owners of Photodocufy (Burnaby, BC -based Underhill Geomatics) to approach Sumac to become service partners for Photodocufy. After spending considerable time over the summer period being trained in Photodocufy’s procedures, in Ontario and Manitoba, it will be Sumac who will be responsible for delivering Photodocufy projects and our highly experienced field crews collecting the images for them. The official launch of the Photodocufy service into eastern Canada will take place at the CanBIM Technology Built Innovation IV: Smart Cities event at the Metro Toronto Metro Convention Centre, on Thursday September 20.